Picture, if you will, a tramway where former Frankfurt Duewag L cars from the late 1950s pass former Dresden Tatra T4s, KT4Ds from Berlin and Duewag ZGTs from Rotterdam, all in the liveries of their previous owners ! This is no museum line however - welcome to Galati ! Galati (pronounced Galatz) is an industrial city on the River Danube in the south eastern part of Romania, about 230 km by road from the capital Bucharest. The population of Galati is approximately 300,000. Galati has an extensive standard gauge tramway operated by ‘Transurb S.A.’ and at the time of filming had seven primary routes: (7, 8, 35, 36, 39, 44 & 54) which ran continuously throughout the day, and eight secondary routes (1, 3, 5, 6, 39b, 40, 43 & 46) which operated periodically. Additional contract services operated to the steelworks and to the local shipyard. In common with most European tramways the routes are operated by single-ended tramcars and turning circles are used at the end of routes. There are two tram depots in use, one as an operational base and one for maintenance. The oldest operational trams are four 1956/1957-built Duewag cars from Frankfurt. These are mainly used, paired with trailers of similar vintage, on Steelworks contract services. A fifth similar tram survives in Galati - now as a children’s party room at the local McDonalds fast food outlet. This latter car also originated with Frankfurt but was used in Bucharest prior to being purchased by McDonalds. 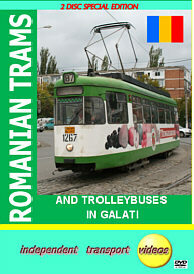 This independent transport videos production shows the Galati tramway in operation during October 2008. We see all of the types of trams that were current at that time, visit the operating depot and ride various routes including a trip on a KT4D across the most impressive concrete viaduct that spans the valley between the city and the steelworks. Transurb also operate trolleybuses, and so Ikarus Astra 415T single deck trolleybuses are also featured. This part of Romania is largely untouched by tourism – so sit back and enjoy these fast-disappearing sights, rarely seen by tram enthusiasts from the west.